Accessories Access: Budget-Friendly Earrings for the Jewelry-Obsessed ($15 & Under)! My biggest style obsession this fall & really for 2015 is earrings, as seen in detail with my Instagram posts (Follow Style Darling Daily @MissAlissaL). I’ve rediscovered my love of the blingy accessory, especially since I’ve recently cut my hair, showing off my collection of studs, chandeliers, hoops, dangles, drops, front-to-backs, & jackets for the every day runway that is life. In an effort to save some cash, but still treat myself here & there, shopping for budget-friendly earrings has been my simple solution when it comes to transforming a look & when I’m in need of some retail therapy. Before I share some of my favorite & elegant picks for not just the season, but really any occasion, I loved the idea of seeking out some extra special inspiration from celebrities who are lucky enough to rock the real thing during red carpet appearances. Celebrity inspiration for killer earrings comes in many metals, colors, & shapes, including some jaw-dropping duds for movie premieres, awards shows, & a slew of other special occasions. Get inspired to upgrade your street style with Jennifer Lawrence, Cara Delevingne, Kerry Washington, Olga Kurylenko, Chrissy Teigen, Angelina Jolie, Bella Thorne, Rihanna, Taylor Swift, Jenna Dewan-Tatum, & below on Jessica Chastain, Sofia Vergara, Chanel Iman, Kate Winslet, Drew Barrymore, Sarah Jessica Parker, Julianne Moore, Demi Lovato, Sarah Hyland, & Diane Kruger. Of course, there are tons of retailers to select discounted fashion jewelry from, including multi-metal hoops that’ll take your blouse & skinny jeans from day-to-night, oversize studs from work to happy hour, clustered stones from a date to brunch, & other genius possibilities. What’s even better is that the below deals are all under $15.00! SHOP: 1.vintage hollow out earrings ($3.99, was $5.22) in gold @Romwe, 2. tassel earrings ($12.99) in purple @H&M, 3. filigree earrings ($10.00) in black @Dress Barn, 4. Milania dangle earrings ($13.00) in white @Charming Charlie, 5. evil eye earrings ($14.99) in silver / gold @Bollywood Chic, 6. round stud earrings ($9.00) in champagne @Francesca’s, 7. pave disc front & back earrings ($12.00) in gold @River Island, 8. clustered faux stone studs ($5.90) in antic gold @Forever 21, 9. carved cluster earrings ($5.00, was $9.50) in pastel @Icing, & 10. faceted kite earrings ($6.57, was $10.95) in black @New York & Company. To shop more affordable earrings (where you can also watch out for great sales & coupons), shop Express, JC Penney, Kohl’s, Boohoo, LOFT, BaubleBar, The Limited, ChicNova, Lane Bryant, Target, Charlotte Russe, Belk, GOjane, & Zappos. Where do you like to shop for fashion jewelry? 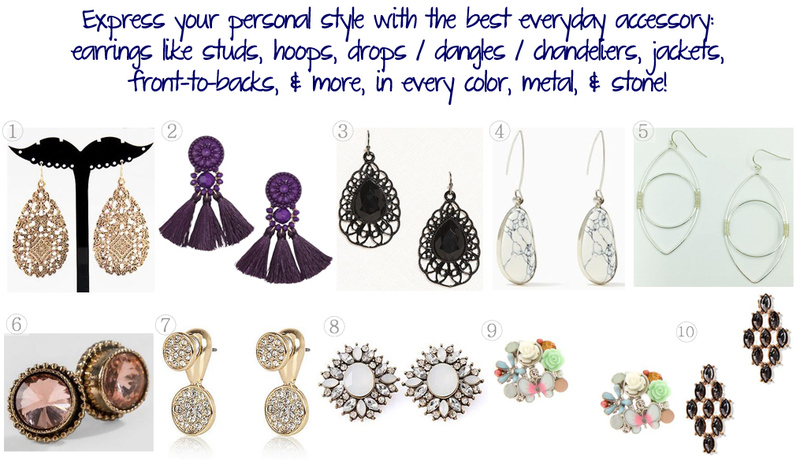 What’s your earrings style? How many pairs of earrings do you wear daily? For more stylish posts, check out Olivia Palermo’s Victorian photo shoot for Holt Renfrew, how to get Victoria Beckham’s orange pants look for any size, Michelle Williams & Alicia Vikander for Louis Vuitton’s The Spirit of Travel, & fall flats for the office inspired by Emmy Rossum & Jennifer Lopez. Happy Styling! This entry was posted in Accessories Access, Basics for a Bargain, Luxury Look-Alikes For Less, Quickie Darling Deal & Steal, Red Carpet Review, Splurge or Save?, Style Darling Daily and tagged Accessories Access, affordable accessories, affordable fashion, Angelina JOlie, Basics for a Bargain, BaubleBar, Belk, Bella Thorne, bling, Bollywood Chic, boohoo, Cara Delevingne, celebrity, celebrity inspiration, Chanel Iman, chanelier earrings, Charlotte Russe, Charming Charlie, ChicNova, Chrissy Teigen, dangle earrings, Demi Lovato, Diane Kruger, Dress Barn, Drew Barrymore, drop earrings, Dynamite, ear jackets, Earrings, Express, fashion, fashion for all, filigree, Forever 21, Francesca's, front to back earrings, GOjane, gold, H&M, hoop earrings, Icing, JC Penney, Jenna Dewan-Tatum, Jennifer Lawrence, Jessica Chastain, jewelry, jewels, Julianne Moore, Kate Winslet, Kerry Washington, Kohls, Lane Bryant, LOFT, Luxury Look-Alikes for Less, must haves, New York & Company, Olga Kurylenko, Quickie Darling Deal & Steal, red carpet, Red Carpet Review, Rihanna, River Island, Romse, rose gold, Sarah Hyland, Sarah Jessica Parker, silver, Sofia Vergara, Splurge or Save?, stud earrings, style, Style Darling Daily, style for all, style for days, Target, tassel earrings, Taylor Swift, The Limited, Zappos. Bookmark the permalink. ← Cover Craze: Olivia Palermo Channels Victorian Style as Holt Renfrew’s Debut Muse!